Nestled amongst the North Florida School of Special Education’s Mill Creek Road Campus lies Berry Good Farms – an urban farm featuring a wide variety of fruits, vegetables and herbs, as well as hydroponics and aquaponics, vertical grow poles, a 30×60 greenhouse for herbs, veggie starts and microgreens and an air-conditioned growing shed for wheatgrass. Organic practices are applied in all growing areas on the farm. The seeds for Berry Good Farms were sown in 2011. Through careful cultivation, loving hands and big dreams, we have seen its roots take hold in our community, and Berry Good Farms continues to grow into a self-sustaining, viable industry for students and Post-Graduates at North Florida School of Special Education. At Berry Good Farms, our goal is to provide sustainable food in an ecological manner through the compensated employment of our Transition Students and Post-Graduates, who continue to strive for independence and productivity in the community. Visit the Berry Good Farms website at www.berrygoodfarms.org. 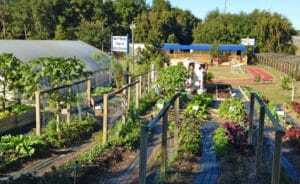 The mission of Berry Good Farms, a division of North Florida School of Special Education, is to educate and employ individuals with intellectual and developmental differences while providing the community with a valuable service through local enterprise, entrepreneurship, and educational opportunities. The vision of Berry Good Farms is to provide a self-sustaining industry for students and graduates encompassing education, hands-on experience, and compensated employment. Transition students and Post-Graduates will be trained in the field of horticulture, culinary arts and the production of agricultural goods. Barkin’ Biscuits is an all-natural dog treat baking operation out of North Florida School of Special Education that provides Transition Students, Post-Graduates and young adults with intellectual and developmental differences in the community another form of vocational training. The program is offered three days a week and attracts chefs ranging from 18 to 40 years of age.